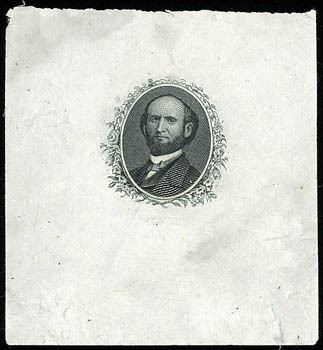 Barnes & Co., Vignette Essay, oval portrait used for the unadopted 6¢ essay, with additional floral border, on India (46x50mm), Very Fine and rare, only two examples reported. 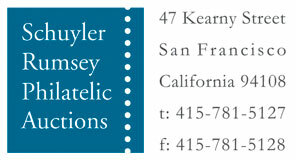 Barnes & Co., 1¢ green, trial color large die proof, on India, stamp size with large even margins, fresh and Very Fine. Barnes & Co., 1¢ black, large die proof, initial approval proof on on India (88x43mm), with manuscript "approved Aug 28th, 1866" approval date and "E.A. 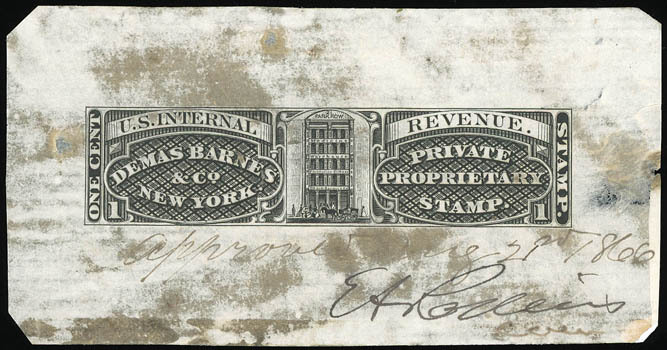 Rollins" signature of Commissioner of Internal Revenue, some mounting gum soak and thinning at right away from stamp design, accompanied by original the original Demas Barnes entry from Butler & Carpenter order book for the 1¢, 2¢ & 4¢ plates, F.-V.F. Scott No. RS24P1 Estimate $1,000 - 1,500. Barnes & Co., 1¢-4¢ black, large die proofs on India, each with wide margins (82x34mm or larger), couple small flaws, otherwise Very Fine.